Vincanne Adams, Markets of Sorrow, Labors of Faith: New Orleans in the Wake of Katrina (Durham, NC and London: Duke University Press, 2013, £14.99). Pp. 228. isbn978 0 8223 5449 9. - May Joseph, Fluid New York: Cosmopolitan Urbanism and the Green Imagination (Durham, NC and London: Duke University Press, 2013, £15.99). Pp. 248. isbn978 0 8223 5472 7. 1 Klein, Naomi, The Shock Doctrine: The Rise of Disaster Capitalism (New York: Henry Holt, 2007). 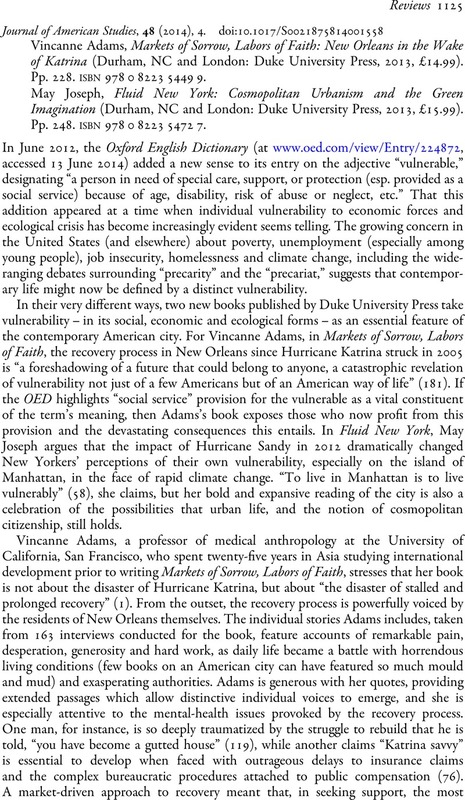 2 Seidman, Karl F., Coming Home to New Orleans: Neighborhood Rebuilding after Katrina (New York: Oxford University Press, 2013).